City Year works to bridge the gap in low-income communities between the support the students in the communities actually need and what their schools are designed to provide. In doing so, we're helping to increase graduation rates across the country, and making an impact in the lives of the students we serve. 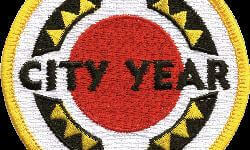 City Year is an education organization fueled by national service. City Year partners with public schools in low-income, urban communities to help students graduate from high school ready for college and workforce participation. Teams of diverse AmeriCorps members serve full-time in schools, where they directly support academic achievement and student engagement - in and out of the classroom. City Year alumni continue to support schools, students, and families across the country and engage in active civic participation in their communities. A proud member of the AmeriCorps national service network, City Year is a public-private partnership, made possible by resources from schools and school districts; local, state, and federal governments; and philanthropic support from corporations, foundations, and individuals. Studies show students who are at risk of dropping out can be identified as early as elementary school, using three early warning indicators: poor attendance, disruptive behavior, and course failure in English and math. We call these early warning indicators "the ABCs," and we know that a student who shows just one of these signs as early as sixth grade has only a 25% percent chance of graduating high school on time with their peers. However, if a student reaches the 10th grade on track and on time, he or she has a 75% chance of graduating. That’s why we try to reach these students early—specifically, during third through ninth grade— and provide them with one-on-one support to help them overcome the challenges they face both in and out of school. Positions at City Year, Inc. Corps Members commit to 11 months of service, working directly with students as tutors, peer mentors, and role models. Additionally, they work one on one with students, assist with after-school programs, and provide support to teachers in classrooms.